At the start of this year, I decided to take up triathlon as a challenge. Part inspired from the Olympics, part after completing the Virgin Active Indoor Triathlon in November and partly to get fit and get some more use out of my bike. Since then, I’ve competed in 5 sprint and super-sprint distance triathlons, one duathlon, joined a running club and signed up for two half-marathons next year. So a pretty packed first triathlon season! In the process of training, I’ve got a lot fitter. Just looking at my results in our monthly club handicap, I’ve gone from running 7km in 36.09 to 32.54, and still improving month by month. Preparing for the swim to start. The pool was heated, but so cold outside! My first ever race was the first in the Thames Turbo Sprint Race Series. It started at the crack of dawn on an absolutely freezing Easter Monday. 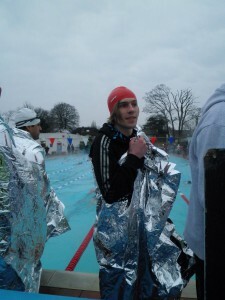 In fact, it was so cold that we were wearing foil blankets before the swim, and T1 (the swim-bike transition) was designated a 5 minute “no-compete zone”, so everyone could dry off and dress appropriately for the bike. I was massively nervous before hand (not helped by my naturally poor timekeeping making me later than I’d hoped for registration), but the marshals and organisers we great – just what was needed when you show up looking lost and not really knowing about setting up transition or body-marking or whatever. I should also say thanks to my partner who also got up at 5am to come and support me in my first race! From that point on, I was hooked. (Although there was a point, 3km in to the 5km run when I thought “Why am I here…?”). I decided to try and race once a month to get experience before my planned ‘A’ race of the season, the open race at the ITU World Finals. This was was another race of firsts: first open water swim and first swim in wetsuit. People always say you should never do anything in a race that you haven’t already practiced. After this race, I’d agree! I spent over 4 minutes in T1 wrestling with my wetsuit and my ankles. Chalk that up as a learning experience! The hustle and bustle of open water swimming was also new, so I was glad it was only over 400m. Otherwise, the race was good and I knew exactly what to expect about the strong wind at Dorney Lake, as it is where I’d entered a duathlon earlier in the season. The wind just makes you fly down one straight, only to struggle back against it on the return. Running the last few metres of the Swim-1st Tri in Crawley. Photo courtesy of Swim-1st Tri. I entered this race partly out of a feeling that experiencing a different course would help and partly as it fitted nicely around other plans. It was the inaugural race of a new club (Swim-1st Tri) in that area, but all the organisation was spot-on and it was a really nice race under beautiful, if not hot, conditions. Another early start though, to get out on the open roads bike course before too much traffic joined us. 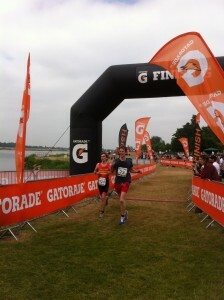 This was the real test before September: a 750m open water swim, back at Dorney Lake. still some improvements to be made to my T1 technique ahead of the big one. Crossing the finish line at Eton. This race was my best yet. A combination of great weather, confidence and having a supporter there meant I finished in a record time. 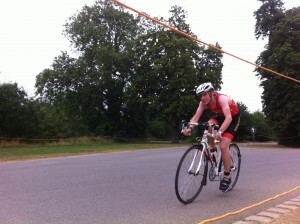 I even managed to beat my time from the previous race at Eton, which only had a 400m swim. I left with a huge grin on my face! No race in August as I wanted to focus on training for this, the race I’d been building up to, as it was the first race I actually entered, back in February. I’d also saved up my pennies and treated myself to a time-trial bike, a Trek Speed Concept 2.5, in a bid get even faster on the bike leg. It worked, and I brought my average speed up to 19.2mph, up from 17.7mph at Eton. Can’t wait for some winter training and hitting next year with average speed of > 20mph for my bike leg. 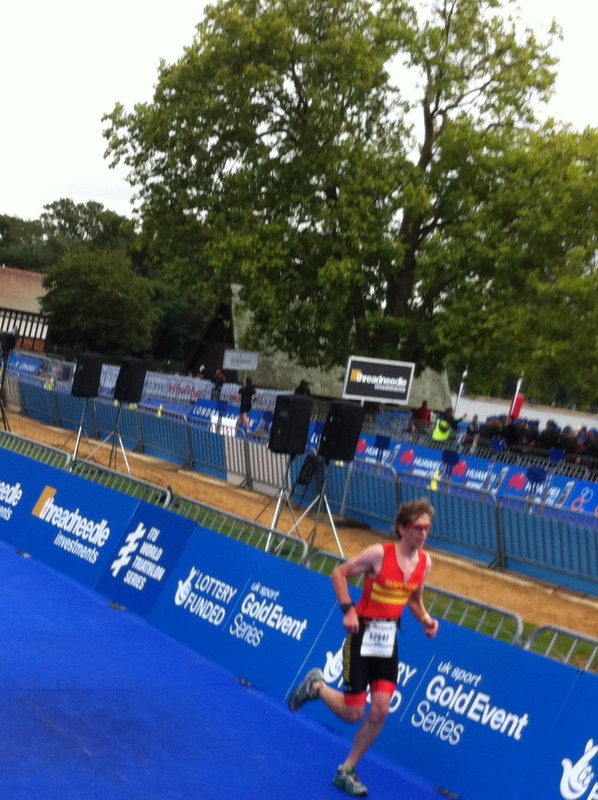 finishing on the famous blue carpet of elite races! 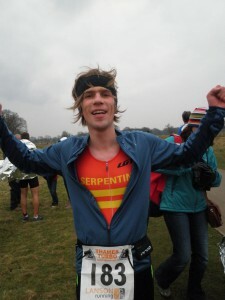 My parents, brother and partner were all watching, as well as friends from Serpentine, and the support definitely helped. The benefit of such a multi-lap course is in being able to see them so many times. I came home in 1:31:15, slower than I’d hoped but mostly due to the long distances involved in navigating transition, which my Garmin showed was >500m each time. My season will truly finish with the London Fields Aquathlon next weekend (6th October), and then winter training for next season and the challenges of my first (2) half-marathons in Bath and Berlin and (possibly) a step up to the Olympic distance. A successful first year in the sport. 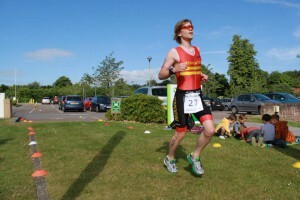 All pictures taken by my partner except as indicated at the Swim-1st Tri in Crawley.